To access STEAM's eBooks through your phone, you need the APP! The app is Follett BryteWave and can be downloaded to any device. STEAM and VAPA students now have access to eBooks through STEAM's catalog! You will need to log into Follett Shelf for STEAM. See the instructions below. If you are a student, use your Student Single Sign On to log in. As a student, you can check out up to 3 eBooks for up to 2 weeks. If you are a teacher, use your Single Sign On to log in. As a teacher, you can check out up to 3 eBooks for up to 30 days. If you are a guest, the username is guest and the password is legacy. As a guest, you can only read the eBook online; you cannot check out an eBook. This link will take you to the online reader - Follett Enlight Cloud - where you can read the book from your computer! *IF you are a NEW student or you are having trouble logging in, please see Ms. Rivas in the library! To read books from your phone, look at the instructions to the left. For phone or tablets, download the MACKIN VIA APP for iTunes and GooglePlay. Use the same log in information for either one. eBooks are available in the Destiny catalog for each school. See instructions on how to access the catalog of your school on the Book Search page. LAUSD eBooks have a BLUE ebook icon (as shown by red arrow). 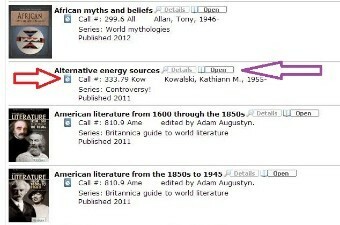 To read the book, click on Open (as shown by purple arrow).